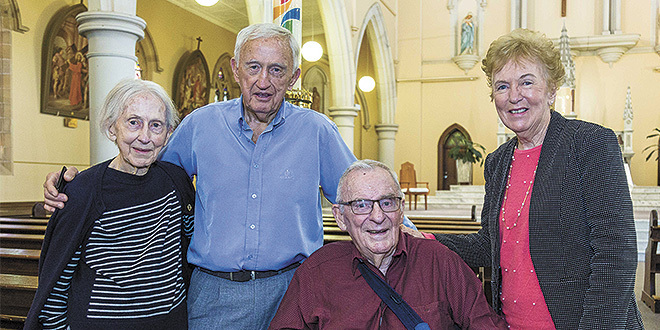 Faith decision: Former Labor leader Bill Hayden (seated) on the day of his baptism at St Mary’s Church, Ipswich, with his siblings Patricia Oxenham, John Hayden and Joan Moseman. ONE of Australia’s iconic Labor leaders and former Governor General Bill Hayden has been baptised as a Catholic at the age of 85, and after a lifetime as a declared atheist. “There’s been a gnawing pain in my heart and soul about what is the meaning of life. What’s my role in it?” Mr Hayden said. “From this day forward I’m going to vouch for God,” Mr Hayden told The Catholic Leader as he prepared to be welcomed into the Church at St Mary’s Church, Ipswich, west of Brisbane, on September 9. 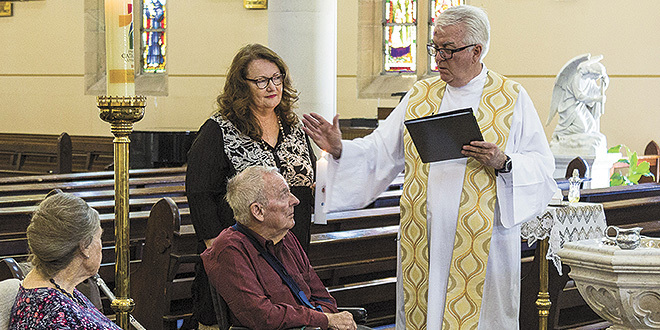 He suffered a stroke in 2014, and as he prepared for the baptism celebrated by Fr Peter Dillon, Mr Hayden was feeling “great pain” from a recent fall in which he broke his shoulder. However he was determined to go ahead. 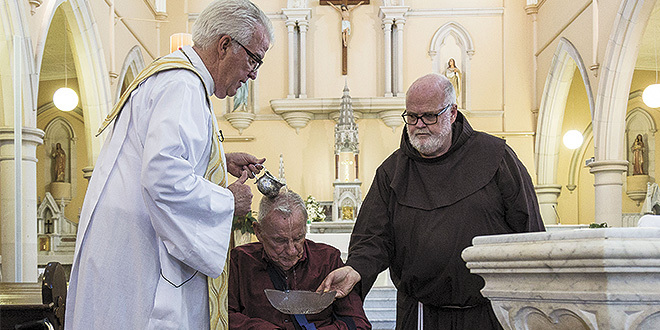 Sacred moment: Fr Peter Dillon blessed Bill Hayden at St Mary’s Church, Ipswich. Fr Dillon said he felt a “real closeness” with the former Australian leader as he baptised him. Mr Hayden attributed his conversion to the influence of his own mother, who was Catholic, and of the Ursuline Sisters, who taught him at primary school in inner-city Brisbane, and who stressed the principles of humanity, social commitment and service to others. However, it was a recent hospital visit to see Sister of Mercy Angela Mary Doyle that proved the pivotal moment in Mr Hayden’s faith journey. 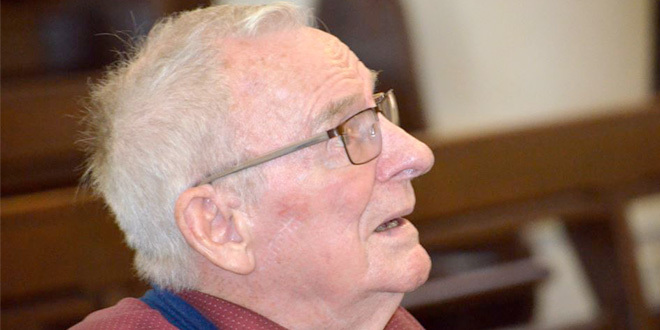 “I have always felt embraced and loved by her Christian example,” Mr Hayden said, of the 93-year-old, who has been a lifelong inspiration of service to him, and who was among the congregation at the baptism. Ironically, Mr Hayden said the message that Christianity was a religion not of rules, but of love came to him while reading a book on Shia Islam by academic Malise Ruthven. “It is about love for your fellow humans, forgiveness, compassion and helpful support,” he said. Blessed day: Fr Peter Dillon baptises Bill Hayden at St Mary’s Church, Ipswich, assisted by Fr Stephen Bliss. Mr Hayden said he hoped his baptism might help others to see the importance of the Church with fresh eyes, especially after revelations of clerical child sexual abuse. Mr Hayden said he hoped to serve the Church. “I would like to play an active part in the St Vincent de Paul Society,” he said. Mr Hayden recalled growing up with a father who treated his mother “quite badly”. “Unfortunately I had experience of what domestic abuse was all about,” he said. Mr Hayden was “indebted” to the Ursuline Sisters who taught him at primary school and shaped his social-policy thinking. He was also shaped by Sr Angela Mary Doyle at Brisbane’s Mater Hospital who “saw to it that the poor received the best medical attention at low cost, and pressed for universal health insurance”. “Without her, there would have been no Medibank and no Medicare today,” Mr Hayden said. “She displayed enormous courage in standing up for those principles against strong opposition, including from the medical profession. “Later she again showed her strength and morality in standing up to narrow-minded political leadership in Queensland which wanted certain patients treated as though their often terminal illness was God’s judgement on them – something quite contrary to her Christian spirit and compassion. 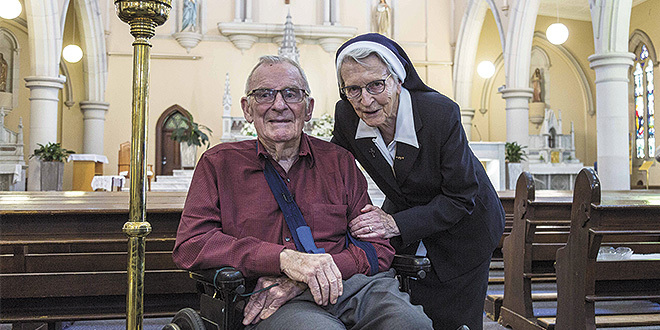 Faith inspiration: Bill Hayden and Sr Angela Mary. Mr Hayden started his adult career as a policeman before entering politics. He succeeded Gough Whitlam as Leader of the Opposition and led the Labor party for six years, including an election defeat in 1980. Just weeks before the 1983 election he resigned after key frontbenchers switched allegiances to support Bob Hawke as leader. In a Hawke government, Mr Hayden served as Minister for Foreign Affairs from 1983 to 1988 (Trade was added to his portfolio from 1987), and was then appointed governor-general for seven years. Mr Hayden said he’d been wrestling with the idea of becoming a Catholic for a long time. Among messages of congratulations he received a “marvellous letter” from former prime minister Kevin Rudd. Brisbane Archbishop Mark Coleridge also congratulated Mr Hayden. Gazing on Jesus: Bill Hayden looking at the crucifix in St Mary’s Church, Ipswich, on the day of his baptism.